Contents: Preface, 8 Chapters, Bibliography, Notes links, Author´s biography. There is not any sheet music in the book. The CD contains: 1 composition by L. van Beethoven + 15 compositions by A. P. Heinrich (piano – Pavel Farský). January 2019 – Many thanks to all people and organisations who cooperated with us in the last year/s. We are looking forward to our future projects. Many thanks also to all people who wish us good luck and succes. We wish you all happy year 2019. We are looking forvard to the meetings with you and A. P. Heinrich´s music. 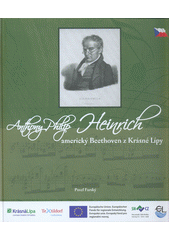 29th August 2018 – A book titled “Anthony Philip Heinrich – American Beethoven from Krásná Lípa” was presented on Wednesday, August 29th, 2018, in Großschönau, Germany, at the music show of the same name. The author of the book – the pianist and musicologist Pavel Farsky and the choir, Krásnolipský komorní sbor, led by Mgr. Milan Sudek, played and sang compositions by A. P. Heinrich, L. van Beethoven, Thaddeus Palme, Johann Janák and Josef Groh. The concert and the presentation of the book were a part of the project Umění nezná hranic/Kunst ohne Grenzen/Art without borders financially supported by the European Union. In the book published by the town Krásná Lípa, the author describes Heinrich’s life, his music work and the cultural environment that surrounded him. Pavel Farsky used as a source the world prestigious musicological literature about A. P. Heinrich, the literature about the history and culture of the Šluknov region and also his own findings. 3rd May 2017 – 160 years ago (1857) Anthony Philip Heinrich presented his work first time in Prague. The noon concert was in Žofin hall. Seventy-six-year-old composer heard his following works: 1. The Wildwood Troubadour (vocal and instrumental compositions), 2. Symphony National Memories (1st movement – “God Save the Queen), 3. Symphonic work The Columbiad or The Migration of Wild Passenger Pigeons. Musicologist William Treat Upton writes about the concert: “ Heinrich´s various compositions were greeted with much applause at their performance and the composer was the recipient of a flattering personal ovation.” (biography – Anthony Philip Heinrich – a Nineteenth-Century Composer in America, AMS Press, 1967, page 232). – 156 years ago (1861) died A. P. Heinrich in New York and was buried in ornithologist James Audubon´s family vault in Bronx. Anthony Philip Heinrich – American Beethoven From the Heart of Europe or Journey from Krasna Lipa to New York. 19th October 2016, Český rozhlas – Vltava, 20.00 hod., Akademie. 5th October 2016 - The music show about Anthony Philip Heinrich called “American Beethoven from Krásná Lípa” was Prague premiered on Wednesday, October 5th, 2016, at Antonín Dvořák Museum in Prague. The show was organized by the International A. P. Heinrich Society and it was held under the auspices of the senator Ing. Zbyněk Linhart and with the support of town Krásná Lípa. In the evening, Pavel Farský, the show author and protagonist, played the piano compositions from Heinrich´s most successful collections “Dawning of Music in Kentucky, or the Pleasures of Harmony in the Solitude of Nature” and “Western Minstrel”. He also performed unique compositions that he had obtained by studying archival materials; “The Camanche Revel”, “The Sioux Gaillarde” and “Manitou Air Dance”. Mr. Farský also presented aspects of the composer´s life, including new information based on his own scientific research done over a period of eighteen years. The evening was pretty successful. Thanks listeners for visit. Many thanks to Jana Farská who organized the concert and to Lenka Klecánová who helped her. 3rd May 2016 – 155 years since A. P. Heinrich´s death. 11th March 2016 – 235 years since A. P. Heinrich´s birth. 1st January 2015 – We wish all website visitors Happy New Year 2016! I warmly thank for cooperation and assistance to: J. Farská, S. Hájková Wagnerová, V. Hieke, K. Jarolímek, J. Němec, Š. Pešková, E. Sklenářová, M. Šťastná, Krásná Lípa City, the House of Bohemian Switzerland in Krásná Lípa, the National Museum – Museum of Czech Music and others who inspired us and cheered for us. P. Farsky. 11th September 2015 – The music show about Anthony Philip Heinrich called “American Beethoven from Krásná Lípa” was premiered on Friday, September 11th, 2015, at the Cultural House in Krásná Lípa. The show was organized by the town of the same name. In the evening, Ing. MgA. Pavel Farsky, the show author and protagonist, played Heinrich´s renewed premieres of the compositions that he had obtained by studying archival materials. Mr Farsky also presented aspects of the composer´s life, including new information based on his own scientific research done over a period of seventeen years. The dates of the show reprises, in which Mr Farsky will introduce renewed premieres of the other Heinrich compositions, will be announced on this web page. 11th March 2015 – 11th March 1781 was born Anthony Philip Heinrich. 4th January 2015 – Mr. Igor Heinz, musician, composer, musicologist and author of the book “From the Music History of Sluknovsko”, in which he devoted one chapter to A. P. Heinrich, died. Christmas 2014 – we wish all website visitors Merry Christmas! I warmly thank for cooperation and assistance to: J. Farská, S. Hájková Wagnerová, E. Sklenářová, A. Sedlák, L. Knežević, E. Paulová, M. Šťastná, the Parish of St. Mary Magdalene, Krásná Lípa City, Prague Film School and the National Museum – Museum of Czech Music and others who inspired us and cheered for us. P. Farsky. 21st December 2014 – we published a reproduction of A. P. Heinrich´s portrait on this website, which is the subject of collection of the National Museum – Czech Museum of Music. Thank you for granting rights to use this image. 1st December 2014 – I met with members of The Dvořák Society for Czech and Slovak Music (Great Britain) Pat and Shawn Pullman and Peter Herbert. The meeting was held in a friendly, informal and inspiring atmosphere. The main topic was neither Heinrich nor Dvořák, but generally music that doesn´t know borders and unites nations. Dear colleagues, thank you for a pleasant afternoon and good luck. Pavel F.
November 2014 – The Animation Strategy of the Anthony Philip Heinrich´s music work was updated. Summer 2014 – we visited a cemetery in Krasny Buk (part of Krasna Lipa), which was used in the 19th century (replaced by newer cemetery in Krasna Lipa). We didn´t find tomb of A. P. Heinrich´s stepfather, but saw at some tombstones that the name Heinrich was used here. 4th May 2014 – was celebrated a Mass for Anthony Philip Heinrich in Krásná Lípa. During service P. Farsky played on the organ these Heinrich´s compositions: Lament of the Czechs (Jungmann´s last moments and the Spirit´s departure, Requiem, Benediction), Multum in Parvo and after Mass Prague Waltz. Jana Farská read Heinrich´s biography before the Mass. Many thanks for the Mass to the Parish Priest Ing. Mgr. Antonín Sedlák and parishioners who supported by their participation. Many thanks to the municipality of Krásná Lípa for the wonderful invitation posters and active promotion. 21st April 2014 – was sent a plea for the Mass for A. P. Heinrich to Ing. Mgr. Antonín Sedlák, the Parish Priest of St. Mary Magdalene´s Church in Krásná Lípa. 20th April 2014 – Meeting of the Committee of the Society. The chairman, Pavel Farsky, proposed to honor A. P. Heinrich by the Mass in the church where he was baptized in 1781 (St. Mary Magdalene´s church in Krásná Lípa). He also chose Heinrich´s compositions in duration and character that will support the intent. The term of the Mass with Heinrich’s music should be close to the anniversary of the composer’s death (3rd May). 16th April 2014 – an official announcement about the Society and its web. 31st March 2014 – were launched these pages. Many thanks to Ing. Sylvie Hájková Wagnerová, Ph.D. for help in their creation. 5th March 2014 – Society was officially registered at the Tax Office in Prague. 4th March 2014 – was opened official bank account of the Society. 3rd March 2014 – The Municipal Court in Prague registered International Anthony Philip Heinrich´s Society into the Register of Associations. 23rd January 2014 – inaugural meeting of the International A. P. Heinrich´s Society.